Hypertension has been ranked as the fourth largest mortality risk factor in the world, accounting for 6% of all deaths. Mild hypertension accounts for the largest proportion of cardiovascular deaths in the United States because of its high prevalence. It is estimated that as many as 58 million adults in the United States have elevated blood pressure (systolic blood pressure greater than or equal to 140 mmHg or diastolic blood pressure greater than or equal to 90 mmHg) or are taking antihypertensive medication. Although improvement in the diagnosis and treatment of systemic hypertension in the past several decades has reduced the morbidity and mortality rates due to this disease, the management of hypertension and its complications challenges all physicians. Systemic hypertension may accelerate the progression of diabetic retinopathy and may be associated with increased risk of renal arterial and venous occlusion. Hypertensive disease, in which there is a persistent pathologic elevation of arterial pressure and increased total peripheral resistance, is associated with vascular lesions in the brain, heart, kidneys, and eyes. Although the causes of hypertension are as varied as they are numerous, in more than 90% of patients the cause is not known. Elevation of systemic blood pressure causes both focal and generalized constriction of the retinal arterioles, presumably mediated by autoregulation. These findings are relatively common in longstanding hypertension. A prolonged duration of particularly high blood pressure can be associated with a breakdown of the inner blood-retinal barrier, with extravasation of plasma and red blood cells. Retinal hemorrhages, cotton-wool spots, intraretinal lipid, and, in severe cases, the development of a macular star configuration of intraretinal lipid can be seen. In severe hypertension, closure of retinal capillaries can be observed. When the choroidal vessels are severely affected by elevated blood pressure, as in acute hypertension, fibrinoid necrosis of choroidal arterioles can cause occlusion of areas of choriocapillaris, with a subsequent breakdown of the outer blood-retinal barrier. In severe cases, the optic nerve can be involved. In most cases, the hypertensive changes are not extensive enough to induce breakdown of either the inner or outer blood-retinal barriers. Instead, the chronic effects of hypertension on the retinal vessels become intimately associated with arteriolosclerotic changes in the retina characterized by vascular thickening. The complex relationship between pure hypertensive vascular changes and the changes of arteriolosclerosis, coupled with the great variation of expression of the changes, makes it difficult to describe a classification of retinal vascular changes due to hypertension alone. The possible role of systemic risk factors, such as hyperlipidemia (high cholesterol), in the development of retinal arteriolar changes has been implicated in previous clinical studies. A recent study performed on a small number of patients has concluded that lipidemia by itself is not a risk factor for the developed of retinal changes. Traditionally, the arteriolar changes of hypertension have been considered to result primarily from vasospasm, whereas the arteriolosclerotic changes result from thickening of the arteriolar wall. Because hypertension has such as important effect on the development of arteriolosclerotic changes, it is impossible to consider them entirely separately. This relationship must be considered when any of the existing classifications of hypertensive or arteriolosclerotic changes are used. 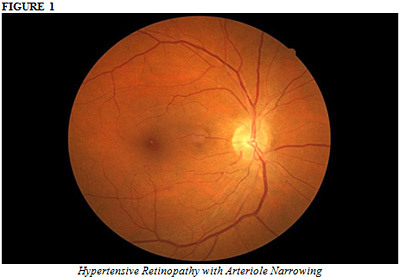 Diffuse arteriolar narrowing is a hallmark of hypertensive retinopathy. Although it can be seen as an acute vasospastic response to acute hypertension, it is more commonly seen in chronic hypertension. This reduction in the caliber of arterioles is largely responsible for the reduction of the arteriole-to-venule (A/V) ration associated with hypertension. The normal ration is 2:3. Focal arteriolar narrowing is attributed to localized areas of spasm of the arteriolar wall and can be reversible. Persistent focal arteriolar narrowing may be due to edema in the wall of the arteriole or to localized areas of fibrosis. Hypertensive arteriolosclerosis refers to the progressive increase in the elastic and muscular components of the wall of the arteriole induced by hypertension. With longstanding hypertension, elastic tissue forms multiple concentric layers in the intima of the arteriole. The muscular layer can be replaced by collagen fibers, and the intima can be replaced by hyalin thickening. These changes result in the “onion skin” appearance described by Ashton and Harry. With advancing age, similar changes can develop in the absence of systemic hypertension; such changes are termed senile or involutional arteriolosclerosis. These changes are accelerated by hypertension. The changes in the walls of the arterioles induce a change in the character of the light reflex for the vessels. Grading of these arteriolosclerotic changes by observing the changes in the light reflex is a major component in the Scheie classification. Atherosclerosis refers to the changes that develop in the intima of larger vessels, the medium and large arteries. Lipid deposition in the intima often is associated with calcification and fibrosis, which can compromise the lumen and predispose the artery to thrombosis. Atheromatous changes have been described in the peripapillary retinal arteries and in the ciliary and choroidal arteries. Occlusion of atherosclerotic choroidal arteries is one of the causes of outer retinal ischemic atrophy. Increasing thickening of the arteriolar wall caused by the arteriolosclerotic process causes progressive changes in the appearance of the light reflex from the arteriole. Normally, the arteriolar wall is invisible; only the column of red blood cells in the lumen is visible, which appears as the red line we recognize as the vessel. Reflection of the incident light from the convex surface of the normal arteriolar wall causes a thin line of reflected light to appear in the middle of the blood column — the normal light reflex. As the wall becomes thickened, the light reflex loses its brightness and becomes somewhat broader, duller, and more diffuse in appearance. This is the earliest sign of arteriolosclerosis (Figure 1). With increasing thickening of the arteriolar wall and decreasing lumen, there is further diffusion of the light from the arteriole, and the light reflex takes on the reddish-brown hue of the “copper wire” reflex. With good control of hypertension, however, this finding is relatively uncommon. As the process continues, there is further thickening of the arteriolar wall with associated reduction in the lumen. When the column of blood can no longer be visualized, even as the thin line, the arteriole assumes the appearance of a “silver wire.” Although these vessels do not appear to be carrying blood, fluorescein angiographic examination reveals that they often can be perfused. This extreme is also an uncommon finding when systemic hypertension is controlled. Arteriolosclerotic thickening of the vessel wall also affects the appearance of the arteriolovenous crossing. The arteriole and venule usually share a common adventitial sheath where they cross, with the venule lying anteriorly. Both vascular sclerosis and prevascular glial cell proliferation contribute to the compression of the venule and constriction of its lumen, causing the appearance of arteriolovenous “nicking.” This venous compression (Gunn’s sign) varies in severity, from a very mild tapering of the venous blood column, to more severe tapering, to interruption of the visible column. The sclerotic changes also can cause deflection of the venule as it crosses the arteriole (Salus’ sign). Normally, the venule crosses the arteriole at an acute angle. With increasing sclerotic changes, the venule assumes a more obtuse angle with respect to the arteriole at the common crossing, and in some cases it crosses the arteriole at a right angle. 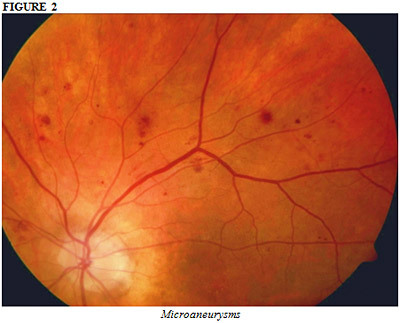 Retinal microaneurysms occur in a wide variety of retinal vascular diseases, including hypertension, and are a nonspecific finding (Figure 2). Ashton noted the associates of microaneurysms, cotton-wool spots, and nonperfusion of retinal capillaries in hypertension. 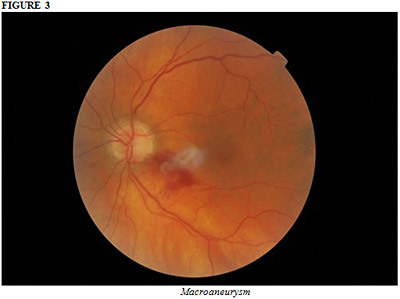 Retinal macroaneurysms also may be associated with hypertension (Figure 3). In a review of 120 patients with retinal arterial macroaneurysms, 75% of patient in the series were women and 67% had hypertension.